XE368, another FGA.6, resided at the Flambards Village Theme Park in Helston for many years. 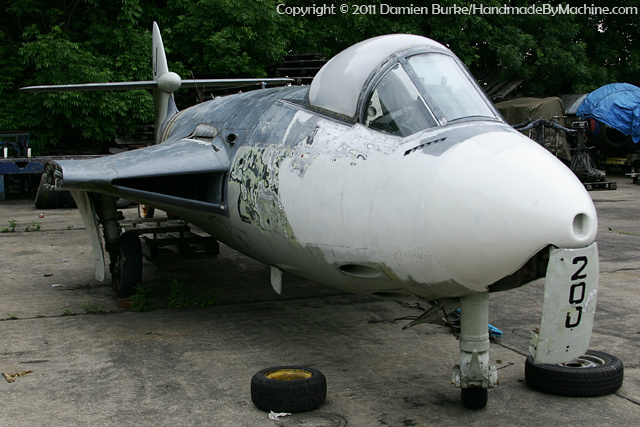 As the aircraft collection at Flambards slowly shrank, XE368 did indeed move on to new pastures as predicted, and was stored at Bruntingthorpe for some years from late 2002. A full restoration began in 2004, with the hope that she'd be put on public display in due course, but she was instead sold to the current owner who transported her to Cumbria in 2006. She is apparently destined to be part of the nascent Walney Aviation Heritage Museum - updates welcome.